If you are looking for a fuchsia with foliage and flowers, Fuchsia Coralle could be one worth considering. The flowers are attractive, and the foliage is large with good colour and texture. 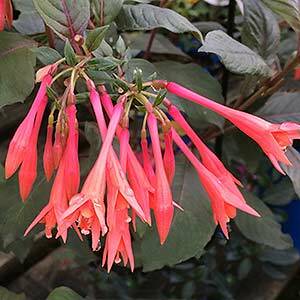 With contrasting coral pink flowers and blue green foliage Fuchsia Coralle is a very attractive, long flowering plant. The flowers are variously described as ‘Salmon Pink’ and ‘ Coral Pink’. Long and tubular in shape, hanging in clusters. This is a Tryphilla cultivar, long flowering with contrasting coral pink flowers and blue green foliage. Fuchsia Coralle is a very attractive, long flowering plant. The flowers are variously described as ‘Salmon Pink’ and ‘ Coral Pink’. Long and tubular in shape, hanging in clusters. This is just one of the many Fuchsia varieties available for sale online. This is a Fuchsia that likes a warm, yet protected position. Filtered afternoon light is most suitable in warmer climates. A humus rich soil with some moisture is best, god drainage is essential. Fuchsia Coralle can be tip pruned after flowering to maintain a bushy compact plant. An application of a slow release fertiliser in late winter, along with a top dressing of compost and a little mulch will be beneficial to growth and flowering. Position – Morning sun, filtered afternoon light. Flowers – Salmon or Coral Pink. Flowering time – From spring through to Autumn.